After consultation with my personal psycho-analyst I've decided to return to the world of clean eating. I did this in the spring, lost weight easily, discovered a range of new recipes, felt great. Then I began to revert to the old ways and whilst I still cook some clean eating recipes, try to stick to the snacking principles and eat less of certain junk foods overall I've not kept it up. That was a shame as I was, ironically, enjoying my food far more then. Back to the present and October isn't working. September went well and not weighing worked very well. I still think that is the way to go, but perhaps the focus or the objective needs to refocussed alongside? If someone were to ask me my main motivation for losing weight and getting down to the nominal target of 11st I'd say its running. Losing weight means a faster runner, simple as that. Sure, I also want to look good and there's a small element of long term health and longevity as motivators but its mainly the running. How strong is the motivation now though? Well, the long term health and longevity is never going to be strong enough on its own and I'm already in a healthy weight range. Looking good isn't a biggie now either. If I look back at pictures from when I was carrying another 3st or I don't like what I see but where I am now looks ok. Sure I might look a little better a few pounds lighter but overall I'm pretty happy with how I look. That just leaves the running but that's become a bit nebulous. My main target is Paris which is still nearly 6 months away; secondary target races aren't until January and to a lesser extent the end of November. I'm racing on Sunday but it wasn't motivating me enough in recent weeks to trim down. They're now less important and, for the most part a long way away. That makes the connection between what I eat today and how I perform then a very tenuous one. That's where clean eating comes in. That will switch the focus to healthy eating and rediscovering that feeling of energy and vitality I had in the spring. Weight loss will almost certainly be a bi-product and if it isn't, well, there certainly won't be any risk of weight gain and I'll still feel good. Not too bad on the aches and pains front - just enough to have me walking with a rather lolloping simian gait. I remember last year that on Sunday morning (the race had been held on a Saturday) I felt quite stiff but still went on to stupidly run a 10k race that morning. This year definitely isn't so bad. Virtually nothing from the calves (which were tightened by the uphills no doubt, but also stretched by the steepest due to the foot position); hammies are fine; quads have a hint of soreness from the long fast down hills but most of the stiffness is in the glutes (mede and max) which will be from the steep uphills. A good stretch and some Pilates later will sort that lot out. The groin/pelvic fatigue I had on Saturday is completely gone so I can go back to daily core exercises today too. The only other after effect is the top of the left foot just below the leg is a bit sore and feels unstable. I know this came from turning my ankle early on in the race on a loose rock but the pain wore off after a couple of minutes, only returning last night. I think that will be fine with rest but hopefully still OK to run on tomorrow evening. I really want a good dieting week this week - October has been at best 'inconsistent' and at worst downright bad - and with the Wistow 10 mile race looming on Sunday I want to trim off a couple of genuine pounds as well as lose any food in transit for then. Ran the Salomon Turbo X trail race near Sheffield this morning. Damned hard work. 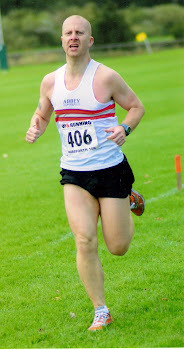 I ran it last year when it was held in September following a dry spell and pushed myself fairly hard, but not all out. I then finished in 1:48:03 for what is an 11.1 mile course. Now, compared to a road race I know that's very, very slow but some of the uphill sections (and its all hills) were so steep that they had to be climbed on all fours, and the man made muddy sections could only really be walked if you wanted any chance of staying upright. Overall that put me in 95th place from about 400 runners. This year it was the same course but it had a very different character - a wet and muddy one! Last year a lot of the narrow trails were very uneven but they were dry, this year they were constant mud and deep puddles and even with Innov8s on I was slipping and sliding quite a bit. I'd pretty much made the decision not to race it just to complete it but after setting off was starting to reconsider but a mile or so in fate intervened to make the decision for me. The runners in front abruptly veered left along a muddy beck down a heavily wooded valley but after about a minute I heard a lot of shouting that we'd gone the wrong way so we had to turn round and climb back to the main path, by which time 100 or so runners must have gone past and I'd guess that I'd lost about 3 minutes. With that 95% of the desire to race was gone. I carried on and for the first 5 miles or so the route generally followed wide forestry commission tracks up and down steep and long hills as well covering maybe 2 miles of undulating forest trails littered with tree branches, roots, mud, becks, rocks and holes. along one of these I nearly went over when I decided to plow straight through a big puddle rather than pick around it and found it to be a whole lot deeper than I'd expected. At 5 miles came the first big challenge: 'Ayers Rock' a very long, very steep slope made of red mud. My guess is that it climbed straight up for about 200m at a 60 degree incline as it was only really possible to climb on all fours. Even at that pace it was far more draining than the running had been and at the end of it my Achilles tendons felt about an inch longer. What followed for the next 3 miles was a series of long steep climbs, muddy descents on treacherous paths and very occasional stretches back on forestry tracks. In addition there was my favourite bit - 100m+ of steep descent down a very rocky but generally mud free path where I could switch the breaks off and hurtle down fell runner style past about 15 people. I love bits like that as most people fight the hill and try and brake whereas I'm happy to take more risks with the route or line I take and can really fly down. Very exhilarating stuff. At somewhere just after 8 miles we entered the 'Turbo Zone' a mile of obstacles that's timed in addition to the main chip timing. This bit consisted of a lot of mud, bogs, river crossings, barriers and what I'd guess was about 400m of mud and water filled trench that smelled awful and regularly came close to waist height causing 'runners' to have to wade slowly through it. That mile took me over 22 minutes. After that it was undulating woodland trail with the usual becks, mud, tree roots, rocks etc, one longish drag uphill then back round some fields for the final uphill half mile to the finish. I was feeling pretty tired by then and had no desire to put on a spurt. I was slowly catching the guy in front and I'm pretty sure I could have gone past him had the desire been there but it wasn't and there was nobody within a minute of me behind so nobody to push me either. Finishing time was 1:54:39 so over 6 minutes slower than last year, but if I take into account the detour that cost 3 minutes or so and the muddy, slippy conditions its probably comparable: about 20 seconds a mile slower if you ignore the 3 lost minutes, which would easily be accounted for by the mud and the less race orientated approach. Happy enough. That's where I've been doing Pilates. Not only have I been massaged and manipulated on a PVC covered bench surrounded by a metal frame adorned with rubber straps and furry hand cuffs (aka the 'Cadillac') but I've now booked in for 7 sessions on a piece of kit called a 'reformer'. Its like the wildest fantasies of a Tory MP or Evangelical minister. I think its worked well though. I had 5 x 1:1 sessions and got my sore neck and sciatica treated as well as some extra mobility from massages to lower body. Additionally I've been given two sets of Pilates exercises to do at home, picking up the second lot yesterday. I spent yesterday's hour doing the latest ones and can certainly tell I've done them this morning! At £38 a week I can't afford to keep it up though but have booked for a 7 week course in the run up to Christmas working on the previously mentioned 'reformer'. Kath, the instructor, believes it'll suit me well and has suggested moving onto the more dynamic Pilates 'jump board' after Christmas as a natural progression. That's what one of the tracks was at my first ever spinning class - Spinning Around by the petite antipodean songstress. Its been in my head ever since and it was only a few minutes ago I twigged as to why. Spinning seems a good one though. A number of people had suggested it to me in the past but I've avoided it as part of my general fear of any class based gym activity but on a whim booked in earlier this week. Fortunately I bumped into an old colleague who showed me how to set up the bike for my height and reach and how to control resistance. That meant I was then able to go straight into the class. It was undeniably hard work though I liked the fact I had some control over how hard and suspect my resistance setting tended to be rather tougher than some of those about me. I certainly hope so - I was sweating cobs within a couple of minutes whereas some didn't seem to break a sweat despite the studio being relatively small and airless. Overall the class lasted a little over half an hour and was well worth it, not least because it didn't aggravate the blister, but it pushed me hard and gave a decent workout for heart, lungs and legs. I've booked again for next week. No, its nothing terrible like a broken leg, recurrence of groin injury or sudden development of ITBS. No, its far more painful than that. Sunday's run, blogged a couple of entries below, gave me blisters from running with tight calves which changed my gait/footstrike. On Monday I applied 3 large Compeed plasters to each foot and that really helped - almost no discomfort during the day yesterday. Not so for last night's run. After about 2 miles I began to feel them and by 4 miles they were effecting me. The inside edge of the right big toe and ball joint seemed to be rubbing badly through the Compeeds and the one right beneath the gap between big and second toe on the left foot felt like someone was holding a lit match to the skin (not helped by the compeed there having worked loose as its an awkward spot). I may have to avoid running for the next 4 days to let them settle ahead of Sunday's race and apply a taped dressing to the left foot before the event. That's a real b*gger as other than the blisters I feel good. I've got back on the logging/weight loss process since Sunday and have worked out a loose daily exercise plan to get me doing Pilates exercises daily along with concerted work on the recalcitrant calves and a general stretching and lower body strengthening routine. I'd got very lax with all of that for many weeks so I'm just setting myself up to do calves and Pilates about 6 days a week and the other stuff about 3 times a week each. Ethos is the same as weight loss - less structured pressure hopefully leading to more compliance. Last night's run was a club run of 7.34 miles at an average of 7:57 a mile over a fairly hilly course - a series of long up or down hills with about 170m of ascent overall. Pleased with that - just the sort of run, pace and gradient I want from Tuesday runs - tough enough to give some good training effect but not cause any particular feeling of fatigue or stiffness the next day. Assuming running is off the agenda the rest of the week probably will contain...CV at the gym today, Friday and maybe Saturday and my very first Spin class tomorrow. Wish me luck! Anyone got any tips for spinning? Regularly on the 'Runners' messageboard on www.weightlossresources.co.uk I'll see people ask what trainers they should get and see a flurry of responses that they MUST get suitable shoes from a specialist shop. That to do so is the first rule of running. well, in a somewhat disjointed manner here's my take and experience on that subject. When I first started running in 2006 I was quickly advised to get some trainers suitable for my running style, and that I should get these from a proper running shop rather than a general sports shop. The basis of this advice was that we each needed one of three types of shoe: neutral cushioned; stability or motion control. If we didn't get the right shoe we'd get injured. It was inevitable. If we didn't have enough cushioning then the impact would wreck our knees and if we were in the 80% of runners who apparently 'over pronated' and we didn't get some stability or motion control shoes we were heading for a world of injury. Since then a host of new shoe technologies have been launched and gait analysis testing has been introduced at most of the ever increasing number of specialist running shops and this, its claimed, will ensure the right shoe is advised for the individual. If it doesn't then there's also the option of custom made orthotics from a podiatrist to fully correct the various failings of your gait. We have many millions of years of evolution during which time a principal reason for our survival and dominance has been the ability to run for long distances. How does that square with the notion of 80% of us over pronating and so courting debilitating injury? Cushioned running shoes have only been available since Nike launched them in the early 1970s, and stability shoes since the 80s. How is it that generations of runners seemed to survive with minimalist running shoes prior to then? Why is it that running shoes need to be heavily cushioned and have stability functions yet people can safely run several miles in a game of football, hockey or rugby without either benefit? If we're generally put into the right shoes why are so many runners injured each year with shin splints, runner's knee, plantar fasciaitis, ITBS etc? In fact, if the shoes are a great help why haven't the numbers of lower leg injuries decreased since their introduction, and why have some ailments actually increased during this time? In the early 70s Nike came up with the master stroke of introducing a cushioned, raised heel running shoe claiming it would increase speed and protect from injury. They created a market and a product that fulfilled it in one go. The trouble was that this raised heel, cushioned shoe interfered with proprioception and encouraged un-natural heel striking and resultant injury. In other words it created another new market: for the stability and motion control shoe full of gadgets to partially correct the problems that the shoes themselves caused in the first place. Then came gait analysis. Another marketing master stroke. Put a treadmill, camera and laptop into the growing numbers of specialist shops that have come into existence on the back of the specialist shoe marketing message, give the owners a brief guide and let them loose. Not only do runners now get a 'scientific' shoe but its prescribed by 'scientific' method. However, the method is flawed in two ways: firstly the training of staff is sketchy and second the start point for gait analysis is a pair of heavily cushioned 'neutral' shoes. In recent years the very same shoe companies have been launching minimalist unstructured shoes designed to mimic barefoot running whilst at the same time continuing to claim the need for cushioned and/or stability. They want their cake and to eat it. Returning to where this entry started, what's my experience been? Well, despite being pain free I did as I was advised and went to a specialist shop. Having looked at me stood in bare feet the sales assistant decided I needed stability shoes and, having watched me jog 4/5 metres across the car park, confirmed I had the right shoes. Kerching! It seemed a good job I'd got them as within a couple of weeks I was getting shin pain...so I went to a different specialist shop, where the assistant told me that the stability shoes were obviously insufficient so I should try motion control shoes. As for the previous shop, he watched me jog a few yards and decreed that they were what I needed. Kerching! They didn't feel right though, really unnatural, and over the next couple of weeks the shin pain was getting worse. So I went to a third specialist shop. This time they didn't bother seeing me run a few paces but instead just looked at me stood up and decided it was back to stability shoes. Kerching! That shin pain just wouldn't go away though and I couldn't run more than twice a week for very short runs over the next couple of months so I went to see a podiatrist who advertised regularly in Runners World. He looked at me stood up barefoot and then got me to run on a treadmill in my stability shoes before taking moulds of my feet as he confidently said I needed custom orthotics in addition to stability shoes. It seemed a rushed experience, particularly as it was costing me over £250. Kerching! Kerching! Kerching! For several months I ran with the orthotics and stability shoes but still struggled to get above 2 runs a week due to lower leg pain. So, having moved in the intervening period, I went to a different podiatrist. This was a different experience. He thought the orthotics I'd been made looked 'very crude' but didn't suggest I replaced them or even carried on. His advice was to cut back on running lengths and concentrate on strengthening and stretching lower leg muscles. Partial success. During this time I had my first experience of gait analysis and was 'prescribed' heavy end stability shoes. Kerching! I was still missing runs with injury though. A few months later a similar experience at another running shop though this time it was lighter stability shoes that the analysis apparently revealed. Kerching! With the third visit it was back to highly stable stability shoes. Kerching! Roll forward to early 2009 when I returned to running after a couple of months off with lower leg pain (funny how my specific shoes hadn't prevented that). I tried a third podiatrist who tried to get me to spend £400 on some highly durable custom orthotics but we settled on a £300 pair. Kerching! Kerching! Kerching! Several months on and they'd cracked near the base and I'd again had a month off with lower leg pain. In June I went on a Chi running course where I was videoed. When I watched the video I was shocked at how I severely heel struck, with the foot fully dorsiflexed, and was told that this would cause alot of lower leg problems. So, I went to a non-specialist shop and bought a pair of neutral shoes and started running in them. 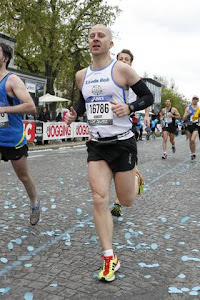 At the same time I made an effort to increase leg turnover to shorten the stride and reduce the heel striking. I'd done everything wrong and according to the podiatrist, the shoe companies' marketing claims and running shop specialists I should have got terrible shin splints. Instead the pain completely disappeared and hasn't come back since. In other words, whilst the 'counter-interpretation' seems to be far more credible when I think about it, its my own experience that confirms it for me. Ultimately I consider the whole 'correct shoes for your gait' to be a complete con. Its worth many millions of dollars to the footwear manufacturers each year, publications like Runners World rely on the advertising of the manufacturers and retailers and the retailers themselves (for the most part) would soon go out of business were they not portrayed as specialist purveyors of specialist products. They all have a very strong interest in promoting the shoe manufacturers marketing messages. To some extent its a self maintaining con too. The overly cushioned, wedge heeled shoes cause an unnatural gait...which can cause injury...which is partially controlled by features in the shoes. Moreover, the presence of a constantly evolving series of patented technologies in the shoes undoubtedly appeals to the gadget loving generation as does the feeling that shoe science can somehow make us better runners - we're very receptive to the warped messages and that's why we don't question the received wisdom from our peers. The only exceptions I'd make are for the tiny minority of people who genuinely do have a problematic gait for whom custom made orthotics (from a credible podiatrist rather than those that have jumped on the bandwagon) is definitely the correct answer. Last week's run was great and in a doomed bid to re-create it I opted to run the same route today; but everything that went so well last week went badly this. From the outset my legs felt a bit dead, no spring in them, and this seemed to effect my gait so that I ran quite flat footed rather than the more fluid feeling forefoot. Despite that (or perhaps because of it?) I had to push myself a little more and at 6 miles, as I reached the reservoir, I was averaging 8:16 a mile but after that the wheels fell off a bit. The first problem was technical rather than physical though. I could feel that the flat reservoir path was naturally making me pick the speed up a bit but when the Garmin beeped for 7 miles I was shocked to see it displaying 9:19 for the previous mile. I knew it was wrong but it was a bit disheartening all the same. When I later uploaded the data I realised the Garmin lost signal at one point where the path follows a narrow inlet for about 0.2 miles so it recorded the elapsed time but not the distance. It was the same for last week. Physically the problems came from mile 8. At the end of this mile there is a steep 0.25 miles rising up from the reservoir and I found that draining particularly as I began to feel the heat from the relentless Indian summer sun. I stopped briefly to buy a drink from a shop which lifted me for a mile or so but after that everything just felt hard work: my legs felt dead, I felt tired and I could tell both feet were blistering painfully. The latter were particularly painful whenever I had to stop to open/close a gate or cross the very busy roads. Ouch. I really had to push myself to keep going or to maintain pace. By the time I finished I was 10s a mile faster than the previous week but it was draining stuff in the last few miles. Whilst I drank a good deal yesterday and this morning I did get quite dehydrated. It was far warmer than I expected and I really needed to get some water in me long before the 9th mile. 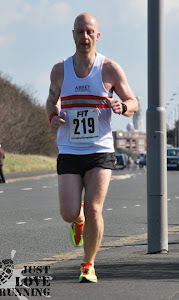 I've really neglected any sort of stretching and strengthening of late and by the feel of my achilles after the run I suspect my calves were extremely tight and that it was this that effected the gait and left my legs feeling unresponsive at the start and dead by the end. I shouldn't have got blisters - usual shoes and socks - so these must have been the result of the altered gait. So, plenty to work on. Overall it just wasn't so much fun. The park was crowded with clueless pedestrians and their dogs and/or children blocking the paths and many of the trails were similar. The roads were busy and difficult to cross and the weather relentlessly warm and sunny. Last week everything felt really fluent even the last couple of tiring miles but this week was the opposite. Still, I'm sure it'll have made me stronger and I feel better for having done it. Ok, so Friday of last week I weighed in and was pleased with the results but then what happened? First of all was my Friday battle. Following an early morning run of just under 5 miles I hadn't planned to do anything different to normal but the opportunity of a lunch meeting at a Persian restaurant presented itself and that felt like fate rewarding me for the previous month's endeavours. I still wasn't sure I'd do too much differently diet wise and deliberately chose healthily (which happily coincided with my favourites if truth be told): an enormous lemon and parsley dressed salad of crisp lettuce, cucumber, tomato and olives; a little bit of homemade bread; grilled chicken, roast tomato and a mound of light rice cooked with tiny broad beans and lots of dill. Trouble is its very difficult to calorie count a meal like that which invariably leads to a temptation to scrap the rest of the day diet wise. By mid afternoon I had half a mind to go OTT though and went to the shops with the purpose of treating myself to a couple of chocolate bars. When I got there there was little I really fancied and half talked myself out of it by settling for a Milky Way! In the evening I still felt fairly full from dinner time so opted, unwisely to 'just have some toast' for tea. Some toast turned out to be about 8 slices. With cheese. Lots of cheese. Saturday started well enough and I spent most of my time cooking but by 7pm I felt sorely tempted to buy sweets. So I did. Lots and lots of sweets. Sunday morning was the long wet run previously blogged and was fairly healthy food wise too with a soya chili and baked potatoes for tea. Then followed a relatively stressful week with work (for various reasons) with copious over eating (to binge proportions) peaking on Thursday and Friday: 5 chocolate bars, big bag of sweets, Mcdonalds, 4 cream cakes. I'm positive it was a response to stress. So that's over a week wasted in terms of diet and having promised we'd have a Chinese for tea tonight my aim is just going to be damage limitation for the day then have a good day tomorrow. Running wise it was a little better. On Tuesday evening I did a fairly brisk and hilly 8.25 miles and then on Thursday a deliberately sedate 4.75 miles. I may get out today for another very short, very easy run and then tomorrow I'll do last week's route again. Well, there you have it. Some positives but overall a less than auspicious week. Hopefully this entry will draw a line under it. Am I becoming Richard Littlejohn? Those that promote a healthy life change (such as the ones about nutrition or fitness) or promote a passion (like running). Blogs that evangelise over a subject and give enjoyment to the writer as much as the reader. These are the positive blogs. Then there are the negative blogs. The ones whose sole purpose is to peddle ludicrous but dangerous (generally right wing) lies about one minority group or another: 'Muslims are all terrorists', 'Working women cause the break-up of the family', 'Britain is broken', 'Asylum seekers get given houses, TVs, cars...', 'Immigrants take our jobs', 'Immigrants are lazy and only here for the benefits'. You know the sort of thing - the sort of insidious drivel designed to give Daily Mail readers a hard on. It gives me a bit of activity and fresh air, as on some days, working from home, it could be the only time I leave the house. Its a good habit to teach the kids - to walk and take exercise rather than rely on a car for short journeys. It probably saves a few pence in petrol each day and makes a tiny contribution to reducing our carbon footprint. It probably doesn't take much more time than driving when getting in/out, parking, waiting at junctions, walking from the car to school etc is taken into account. However, it seems that not all parents share my feelings, but before I go into this let me describe the surroundings of the school. Imagine a long straight road leading to a T-junction with a slightly more major road. Across the road at the head of the T-junction lies the school. On the left of the T on the main road (opposite the school) is a small '7-11' chain supermarket and a bus stop. Outside the school itself and to the right of the T is another bus stop. All along in front of the school the road is marked with zig zag 'keep clear' markings, except for the bus stop which is also 'keep clear'. The last 5m or so of the approach road is also marked as keep clear with the same around the corner to the right and on the left this blends in with the bus stop and continues for another 10m or so beyond that. The school itself is a primary in a 'nice' middle class area and has about 400 children, with all but a tiny handful living less than 10 minutes walk away. On that basis I'd expect parents to walk the kids to school and I'd say that over half do but many don't. I can live with that. Some people are a bit lazy. Trouble is there's a small minority that take their laziness to an extreme. Every single morning there will be 3-5 cars parked all around the corner of the T-junction on the 'keep clear' markings. Generally, but not exclusively, these are husbands/partners who sit there with the engine running for ten minutes while their other halves take the kids onto the playground and wait with them until the bell goes. Three or four times a week I'll see someone do something similar parking in the bus stop outside the shop/cash point. Generally that's not parents, its guys in vans/builders who also leave the engine running while someone else goes to the cashpoint or to get some fags, but last week a lady parked in the bus stop leaving her car there while she took her child into school. Finally, there's about 20 ladies who, one after the other, pull their cars up in the zig zag markings or bus stop by the school while they let their kids out. With some the kids just get out but with many the lady has to get out of the car, let little Tarquin and Gemima out, give them a kiss and say goodbye and sometimes stop for a quick chat with someone before getting back in and driving off. Initially I didn't notice this or feel very bothered. I probably assumed it was people running late. Over time though it dawned on me that it wasn't - it was deliberate choice. The guys who park on the corner in the keep clear area aren't late - they're early - but they choose to cause an obstruction rather than leave their partners having to walk an extra 20m . Then there's the ladies who roll up one after another to drop their little dahrlinks off - its the same people every single day (yes 'GIL5343' silver BMW tourer you're one of the worst) - they don't do it because they'll be late otherwise, they set off late with the intention of doing it. In all cases the actions of the parents cause obstruction and disruption making it difficult for pedestrians to cross safely as they can't always see easily and will have to contend with overtaking cars on the wrong side of the road, blocking the road regularly (remember there's double decker buses come along there) causing congestion, making it tricky for cars to turn into or out of the side road safely etc. For some reason this really annoys me some days. Its not so much the laziness of the parents themselves that bothers me. They're not so different to the people who drive round car parks (even at gyms) to find a space 5m closer to the front door than the sea of empty spaces slightly further away. They're mainly what might be termed the deserving fat. Not the comfort eaters, those with diet problems, disability or even just poor nutritional knowledge etc - they're just lazy. Jamie Oliver got into trouble in some quarters when he described parents feeding their kids a consistently unhealthy diet was tantamount to abuse. Personally I thought he was right and I don't see this as being very different. Its a fundamental responsibility of a parent to teach their children to be active and to think of other people as well as themselves. These parents seem to be clearly failing in that responsibility. Am I right or do I need to get some perspective? Last year I designed my own marathon training plan but unfortunately was prevented from testing it by injury and have since lost it when the old laptop went to the big PC World in the sky. Pros & Cons: 7 runs of 18 miles or more would really give good endurance; no nonsense plan; starts at a low level; the 6 runs a week weeks would be a bit of a concern in terms of injury, no guidance on other exercises or pace; a lot of easy runs; peak mileage week is a bit daunting and is nearly double the start point. Pros & Cons: 5 longer runs is decent enough; low mileage start; guidance on pace throughout plan; 4 runs a week gives plenty of rest but means an average run length of nearly 10 miles which could be difficult to fit in with 3 midweek runs in winter time. Pros & Cons: Similar to Smartcoach in terms of starting mileage and peak mileage; very detailed guidance on pace and cross training; only three long runs so limited injury risk but maybe insufficient endurance training content; emphasis on faster and/or marathon pace running rather than LSR. Pros & Cons: Ostensibly aimed at a category of runner below my current ability; only basic guidance on pace;the 7 runs a week week is a concern; decent quantity of longer runs; fairly limited demands in terms of mileage overall and average run length of under 7 miles so low injury risk; might not push me hard enough. Pros & Cons: Ostensibly aimed at my current category based on 10k pace; starts 10 miles above my (currently assumed) likely weekly mileage in December; very high mileage overall but weekly mileage doesn't increase greatly; 23 mile run in training seems a risk; good interspersing of cutback weeks. I'm really not sure what to go for. I'm modifying Das Uber Plan to push my mileage over 30 miles a week for most non race weeks between now and 19/12 (when the marathon plan would kick in) but starting at 40 miles from week one feels like it has disaster written all over it. I like the idea of running faster like the Brain Training plan but worry that there's not enough longer runs (less than half some of the plans) in it. Running 6 days a week seems risky too - even if some of the runs in such plans are short and easy. I don't know. Maybe I'll need to write my own but keep it flexible? Two days on from D-day so there's a bit of an update needed but first of all I want to describe yesterday's run. Friday's 4.5 miles in the wind and rain had given me a taste for wintry running but lying in bed at 8am listening to the rain hammering down on the Velux window a few feet away did rather test my bravado. Happily I realised it was the morning of the Harewood 10 trail race and as I didn't fancy trying to share a narrow muddy trail with either the quick or slow racers I opted to delay leaving until nearly 11.30. I spent the time looking at marathon training plans but more on that in the next few days. Looking out the window at half past eleven I opted for a quick change of tops, switching the short sleeved climacool top for a long sleeved version in the same design. I had toyed with the idea of wearing the waterproof running jacket but I'd have over heated and ended up wet with sweat and condensation. Off I went, down the hill to the single track lane which soon turned into a muddy track. At this stage the rain was quite heavy and there had been plenty of puddles but as I ran along the track it became increasingly difficult to avoid the muddy puddles that stretched across it. Through a couple of gates and into the woods following a slippy, muddy trail that then became more solid, built up alongside a raging beck. Funny that, as the beck was dramatic and noisy but although I'd ran alongside it dozens of times over the spring and summer I'd never really even noticed it was there before. At the end of the woods I ran under a short tunnel under a main road and into the park. Normally its very busy there but all I passed were an old but sprightly couple bedecked in waterproof capes and a couple of dog walkers who looked like they'd rather be anywhere else. Along the lake side path then up the hill to the road and straight across. That was a rarity - to cross immediately - as on typical Sundays there's a constant stream of traffic but yesterday very few people had ventured out and I didn't have to wait at a single crossing. About 1.5 miles on quiet roads followed, by which time I was completely wet and used to the feeling. There was a breeze but as long as I kept moving it wasn't enough to make me feel cold. Near the end of this stretch my route joined up with what was round about mile 7 of the Harewood race and I passed a number of marshals: some cheery and others clearly wishing they hadn't volunteered. Hat's off to them though - some would have been stood there for well over an hour by then. Leaving the road I headed along the trail, part of Leeds Country Way, and immediately the conditions under foot changed. The trail was muddy, waterlogged and frequently 'blocked' by puddles. Up until then my shoes had been wet but not waterlogged. That changed. I passed 2 stragglers from the race in the 1.25 miles I shared with the route and struggled to get past one as the noise of the rain, and her concentration in trying to avoid puddles where possible meant she didn't hear me approach or the warning shouts of her friend. As the trail left the enclosure it had been contained within there was the best part of a mile where it ran alongside the boundaries of wheat fields and along here it was constant mud and puddles that really were impossible to avoid. On the two hills I was running against or with muddy torrents that were quite dramatic. I loved this bit! At the end of the trail there was half a mile of private road taking me to and across the dam of Eccup reservoir from where I followed a gravel path around the water. My plan here had been to break off left so that the first 1/4 of a mile or so would have been on a woodland trail that ran parallel and above the reservoir side path. That was partly because I like that trail and partly because I knew the reservoir path would be flooded. The path is slightly uneven creating opportunities for large puddles in heavy rain but it also drains poorly and sits within slight embankment going up either side meaning it traps the water. However, within a few yards it became clear the woodland path was a no go: there had been tree felling in operation so the dirt path had been cut up by heavy plant turning it into a muddy bog. I picked my way back to the reservoir path and continued pretty much for 1.25 miles running through one gigantic puddle with the water at ankle height the whole way. At the far end I took the steep access road past the deserted golf course and back to the leafy suburbs of north Leeds. On a mile or so of downhill from here I noticed the sky had got much darker. Until this point the rain had been heavy and persistent but what followed was an absolute cloud burst for 30 minutes. At the end of the road I crossed into more woodland and followed another muddy and deep puddle strewn path to join another road half a mile or so further on with the sound of the rain almost deafening. From here the character of the run changed once again. Up until then it had been wet and often muddy and waterlogged but that was only to be expected on country trails. Here, I was back into an urban environment and expected rather more normality - but didn't get it. First of all was a very steep 50m downhill with a reciprocal uphill. In each direction it was again like running in a raging beck and as I headed up the hill I saw a jet of water shooting up about a foot into the air out of the road - obviously a water pipe in the process of bursting. At the top of the hill there was a short flat section that was flooded and then another short steep hill, again like a torrent. As I turned the corner the side of the road was flooded and what few cars were travelling along the normally busy route couldn't help but send a huge splash all along the path at waist height or higher, so I crossed straight over to a 1/4mile section of public footpath across arable fields to the main road. Once more the mud was thick and the up and down rolling path frequently awash. The tiny trickle of a beck at the bottom was knee deep and 6ft wide, causing a slight delay. When I got out onto the main road everywhere seemed to be flooded. the path was awash the whole way along and gardens flooded. When I looked along a side road to cross water was gushing out of a drain 2-3ft up into the air like a broken fire hydrant in an American cartoon as the drains just couldn't cope with the volume of water. After the best part of a mile I left the road to go back into the woods I'd started in and at this point the rain began to ease off to steady rain rather than storm rain. Across the woods and track and back to the road where, instead of just reversing the route I branched right to add in a couple of hills to take the mileage up beyond 13 miles. Round here it was a different world though. We live near the highest point in the city so it was wet but with no flooding - our water ran straight down the hills to add to the floods lower down! Beyond that I was quite satisfied with the pace of 8:43 average. It was a hilly route and there were times where the conditions made it difficult to run with any rhythm (so running alongside the reservoir I was over a minute a mile slower than the average yet its a flat section that I'd normally expect to be amongst by briskest in the whole run). Moreover, it was a run essentially without breaks (other than a few seconds to open/close a gate, cross the flooded beck or cross a road). All in all very pleased with my endeavours. That's about what I'd have guessed at so it shows I'm developing an accurate sense of what my weight feels like and its nice to be (just) the right side of the 12st mark! On 12th August, after 2 weeks holiday (well, off work anyway) my weight had gone up to 12st 8.2lbs, though I thought some of this was 'food in transit'. I then look to have had a good week dieting wise though still not running well so I could well have dropped 5lbs. After that, and immediately preceding the change of approach, I'd had 12 days of copious consumption so I'd expect, including the food in transit, I'd have gone back to a similar weight as August 12th. If I'm even close to being right then I'd have lost 7lb+ during September which (including early days losses for food in transit etc) is about what I'd hope for. Importantly though, its felt far easier. I've had more calories to play with, no difficult rest days (after allowing myself to do anything up to maintaining then), and I've allowed myself guilt free days off when faced with the stresses of work. The new approach is completely vindicated. Well, if I continue to aim for 1.5lbs a week loss then by the end of October I should be something like 11st 7lb, but that's not a target as such just a rough guide of what to expect. Then, by early December I should reach round about 11st, though I'll review rate of loss at the end of October as I might drop it at some stage which would slow the rate down but also ease the transition to maintaining - though mentally I feel I'm far better placed already to deal with that. And finally...it looks like I'll have been a shade over 12st when I ran the Horsforth 10k last week and therefore about 3 - 3.5lbs heavier than the previous year making the considerably faster time all the more pleasing.